There are some who would have you believe size matters, and that bigger is always better. Well, Mazda’s here to tell you such is not the case, especially when it comes to a practical, family-friendly minivan. Bigger isn’t always better, and the 2016 Mazda5 is evidence of that. You could even call this car from Mazda a mini van thanks to its minute size. However, it’s mighty in terms of design, amenities, interior space (with seating for up to six), and drivability. Truthfully, the Mazda5 is the last to be updated in the Japanese automaker’s lineup, but that doesn’t mean it’s dated. In fact, the Mazda5 features some great character lines and mature good looks. While you won’t find KODO design elements, you will find a modern take on a family hauler that’s sure to turn heads no matter where you go, and it will look great in your driveway for years to come. 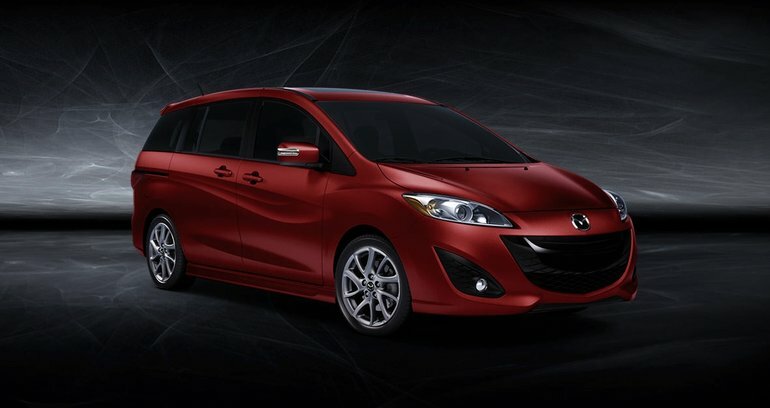 Sculpted siding gives the Mazda5 an air of movement. For 2016, the Mazda5 remains familiar inside. You’ll be great with the same great build quality you’ve come to know and love from Mazda, along with features such as Bluetooth, USB ports, satellite radio, and steering-wheel mounted buttons to control it all with ease while you drive. Ergonomics are spot on, and the cabin is aesthetically pleasing for all passengers. Oh, and did we mention the seats are super comfortable, too? Mazda’s unique placement of the gear shifter up front in the 2016 Mazda5 means there’s plenty of front passenger space. There’s available seating for six in this mighty mini van with a total of three rows of seats. Keep that third row up, and you’ll find 112 litres of cargo space. Fold those seats down and the space grows to 426 litres to store all your goods. Have something a little larger to transport? No problem, fold all rows down and you’re looking at 857 litres of cargo space. Impressed? We thought so. And once you’ve packed everything and everyone up, you’ll be pleased to know you’ll have no problem getting going since the 2016 Mazda5 is outfitted with a 2.5L 4-cylinder engine that pushes out 157 horsepower and 163 lb-ft of torque. There are two transmission choices available: a 6-speed manual and a 5-speed automatic. Power is sent to the front wheels. One of the Mazda5’s coolest and best features is (hands down) its sliding side panel doors. Doors that open as such are ideal for easy entry and exit into the rear seats, and are perfect for small families. Children will have no trouble getting in and out, and loading gear is made simple as well with the Mazda5’s low load level all around. The 2016 Mazda5 is so versatile and functional as a family vehicle. This is a vehicle that offers up plenty of interior space without being an absolute giant on the road; a Mighty Mouse of the mini van, if you will. To find out more about the 2016 Mazda5, head down to City Mazda today to speak to one of our experts. And make sure you book a test drive today, too.